Perlite vs. Vermiculite. What’s the Difference? 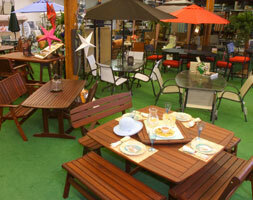 At Scarborough Gardens Patio Shop we have a broad range of products and prices designed to meet your needs. We have the best selection of styles in patio furniture, umbrellas, outdoor heaters, fireplaces, and other patio furnishings. 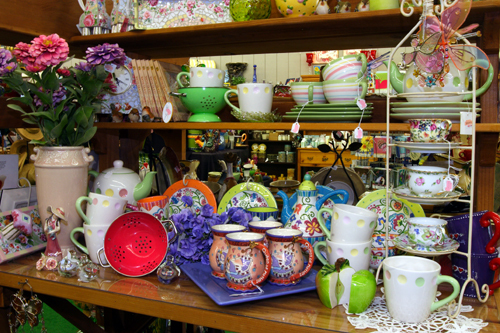 Hidden Treasures Gift Shop is a full-service gift store—that focuses on outdoor and indoor living. We have a wonderful selection of gifts that includes jewelry, kitchenware, small kitchen appliances, cards and artwork. Shipping, delivery and complimentary gift-wrapping is also available. As our focus shifts to being in the sunshine and fresh air, start thinking about what you might enjoy most in your outdoor living spaces this summer. What kind of experiences do you enjoy in your yard? Patio furniture is perfect for entertaining and relaxing. The ethereal sounds of wind chimes calm and bring our attention back to the present moment. Providing feeders and toys for our local wildlife delight all ages. Perhaps the soothing sounds of a water feature brings you joy. Create it. Live it. Share it. Because— finally, sunshine! Keep up with the garden tasks most needed this month by checking out our Garden Guide for April. 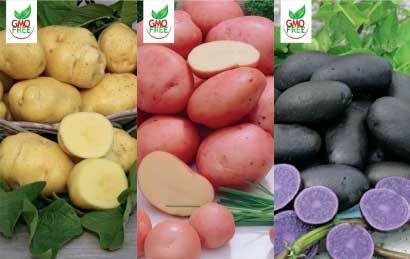 Have you ever tasted home-grown potatoes? Some say there is no comparison to store-bought potatoes. A small number of seed potatoes will yield a few buckets of potatoes ready to eat and enjoy, and can even be stored throughout the winter months. Now is the best time to start potatoes for a late summer or fall harvest! It’s easy to harvest them when grown in containers such as the Smart Pots or other larger containers that are easy to tip at harvest time. To prevent disease problems, do not plant potatoes in the same bed as tomatoes. You will need slightly acidic, well-draining soil, our Recipe 420 Potting Soil is a rich organic soil on sale for the month of April. Hurry in while the selection is the best, we still have a variety on hand, but they are going fast! We all want protection from the sun when we are outdoors, but we want to look good while we are doing it. 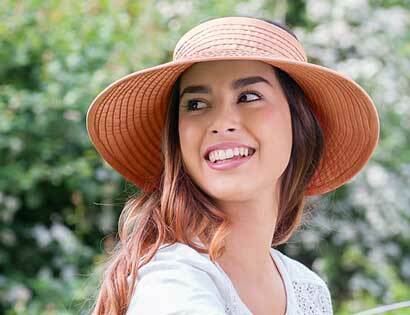 Many styles of hats include a 50+ UPF rating that have been proven to block 97.5% of the sun’s ultraviolet rays. We stock a full range of fabrics including paper braid, raffia, microfiber, and bamboo. With so many styles available, it will be hard to choose just one! Patio Furniture—For You and the Kids too!! Many of us have spent the last few months indoors to stay warm and dry, but spring has sprung, and we are all anxious to enjoy the outdoors! In addition to our Jensen Leisure Ipe furniture line, we have a fabulous selection of value-priced furniture from our Ace Hardware Warehouse. 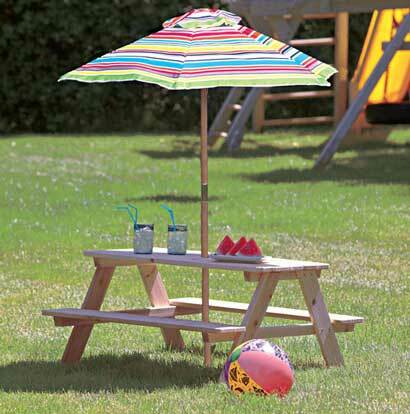 Our inventory also includes a nice selection for children such as a very popular Kids’ Picnic Table that includes a Striped Umbrella. An advantage of our Ace Furniture line is our ability to receive orders from the warehouse weekly which enables us to fill special orders for you or your little ones quickly! Come check out our in-stock inventory or go online to see all items available. Bring music to your garden with our wide selection of wind chimes, including Gentle Spirits, Bells of Vienna and Woodstock Temple Bells brands. Both Gentle Spirits and Bells of Vienna are made to be hung outdoors year round. The top ring is stainless steel, the tubes and sail are coated aluminum, and the cord is a durable synthetic weave. The striker is adjustable and can be raised above the tubes to help “turn down” the chimes on a windy day. 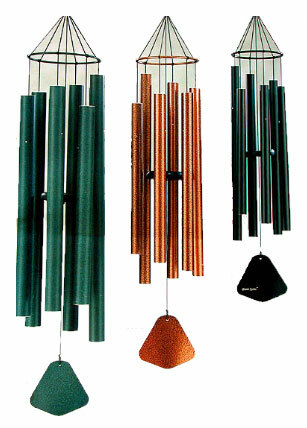 With their soft, beautiful tones and their full, long-lasting resonance, these chimes provide a calming musical aura to your day. Our Woodstock Temple Bells are inspired by ancient bells to work in harmony with the wind to create gentle, soothing tones with just the slightest breeze. in-store specials on many of the items mentioned here. 1. Select a sunny area that has a minimum of 6 hours of sun. 2. Use gopher baskets for your plants, unless you have wired under your planting beds. 3. Pull weeds before they set seed. 4. Double dig your soil and incorporate Gardner and Bloome Harvest Supreme or Planting Mix and a good fertilizer for flowers and veggies. 5. Set-up or reassess and test your current Irrigation System to get it ready for the season. 6. Make a shopping list of varieties of veggies, herbs, and flowers that are known to perform best in your area. Let us give you some ideas! Plant warm-season flowers and vegetables outside from seed or plant start, when temperatures at night are staying consistently at or above 50 degrees. Corn, beans, radishes, carrots and all other root crops are best sown from seed directly into the ground. It is educational and useful to use a Minimum-Maximum Thermometer at your home to monitor the low night-time temperatures in your garden vs. the weather reports for the general area. You may be surprised to discover that you are in a warm pocket or micro-climate allowing you to get an earlier start on your summer garden. Protect roses and tomatoes from diseases such as Powdery Mildew, Rust, Leaf Spots and Blight by using organic Serenade Disease Control (OMRI). Check your irrigation system; especially drip systems, to be sure all parts are working properly. Bait for Slugs. Apply non-toxic Sluggo Snail and Slug Control. Re-apply at 2-week intervals for a total of three applications to help break their life cycle and to give you better control of these pests through the growing season. This eco-friendly product is safe to use around pets, wildlife and people. Fertilize shrubs, trees, lawns, groundcover, etc., if you have not already done so this spring. Even if your plants aren’t actively growing above ground, the roots are working hard to get ready for the big push of growth that happens in spring. Adding mulch around your shrubs will help suppress weeds and keep roots cooler in the upcoming warmer months. © 2008-2016 Scarborough Gardens. All rights reserved.